“The migrant crisis is the 9/11 of the European Union… That day in 2001, everything changed in the US. In a minute, America discovered its vulnerability. Migrants had the same effect in Europe… The migration crisis profoundly undermines the ideas of democracy, tolerance and… the liberal principles that constitute our ideological landscape.” — Ivan Kratsev, Chairman of the Center for Liberal Strategies in Sofia and a member of the Institute of Humanities in Vienna, Le Figaro. The European public now looks at EU institutions with contempt. They perceive them — under multiculturalism and immigration — not only as indifferent to their own problems, but as adding to them. “We are a cultural community, which doesn’t mean that we are better or worse — we are simply different from the outside world… our openness and tolerance cannot mean walking away from protecting our heritage”. — Donald Tusk, President of the European Council. migration crisis would “destabilize democracies“. He was labelled a demagogue and a xenophobe. Two years later, Orbán has been vindicated. As Politico now explains, “[M]ost EU leaders echo the Hungarian prime minister” and the Hungarian PM can now claim that “our position is slowly becoming the majority position”. “The migrant crisis is the 9/11 of the European Union … That day in 2001, everything changed in the US. In a minute, America discovered its vulnerability. Migrants had the same effect in Europe. It is not their number that destabilizes the continent… The migration crisis profoundly undermines the ideas of democracy, tolerance and progress as well as the liberal principles that constitute our ideological landscape. It is a turning point in the political dynamics of the European project”. Migration is having a significant impact, for instance, on Europe’s public finances. Take the two countries most affected by it. Germany‘s federal government spent 21.7 billion euros in 2016 to deal with it. Also reported was that Germany’s budget for security this year will grow by at least a third, from 6.1 billion to 8.3 billion euros. In Italy, the Minister of Economy and Finance recently announced that the country will spend 4.2 billion in 2017 on migrants (one-seventh of Italy’s entire budget for 2016). Spain recently announced that in North Africa, the fence around its enclaves of Ceuta and Melilla, which keeps migrants out of the Spanish territory, will be funded through a further infusion of 12 million euros. Everywhere in Europe, states are allocating extra resources to deal with the migrant crisis, which has also changed Europe’s political landscape. The recent election victories of Sebastian Kurz in Austria and Andrej Babis in the Czech Republic have potentially enlarged the group of Central and Eastern European countries that oppose Brussels — countries that do not want to accept the number of migrants that the EU is demanding. 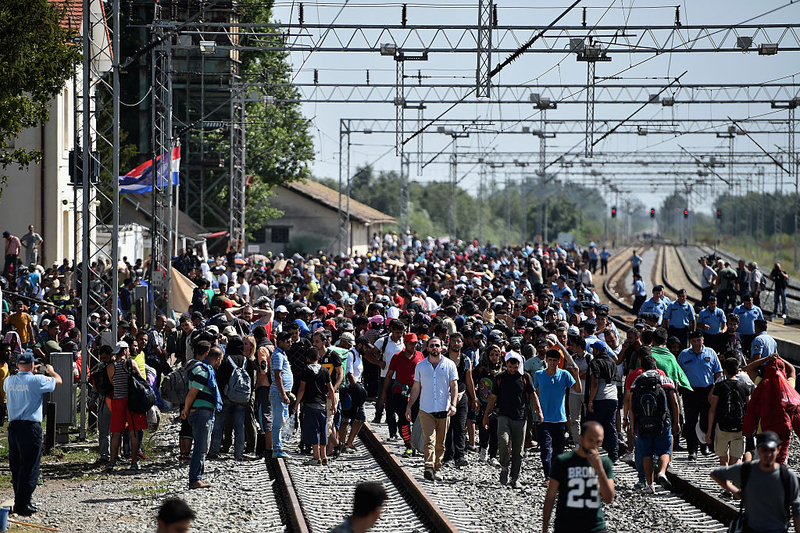 The topic of immigration is fracturing Europe along ideological lines. Not only fences, but rivalry, mistrust and hate now divide the European project more deeply than ever before. The European public now looks at EU institutions with contempt. They perceive them — under multiculturalism and immigration — not only as indifferent to their own problems, but as adding to them. Another political earthquake linked with the migration crisis is “the decline of social democracy in the West”, as Josef Joffe, Editor and Publisher of Die Zeit, recently called it. Everywhere in Europe, the migration crisis has all but killed the social-democratic parties, long perceived as unable to cope with it. Twenty years ago, these left-liberal parties governed everywhere — Spain, Britain, Germany, for instance — but now they are in the opposition everywhere except Italy. From Norway to Austria, Europe is now led by conservative governments. More than half the terror plots in Germany since the onset of the migrant crisis in 2014 have involved migrants, according to headlines as well as a study by the Heritage Foundation. In addition, ever since the Islamic State — now defeated in Raqqa — took advantage of the destabilization caused by Syria’s civil war to become a major driver of the migrant crisis, migration has been a major concern for Europe’s security. From the territory it conquered, ISIS launched major terror attacks on Europe. The migration crisis has also led to the strategic strengthening in Europe of Turkish President Recep Tayyip Erdogan. He has been blackmailing European countries by threatening that if billions of euros and certain political concessions are not given to him, he will open Turkey’s borders to let millions more migrants flood into Europe. Erdogan has not only demanded that Europe jail writers and journalists; he has also tried to influence elections in the Netherlands and Germany by appealing to his Turkish constituencies there.